Google’s Nexus range has been impressive from the get-go and as the dynasty grows we, the smartphone buying public, get more and more features, tech and hardware stability to help us run our lives and stay in touch with the people that matter most. 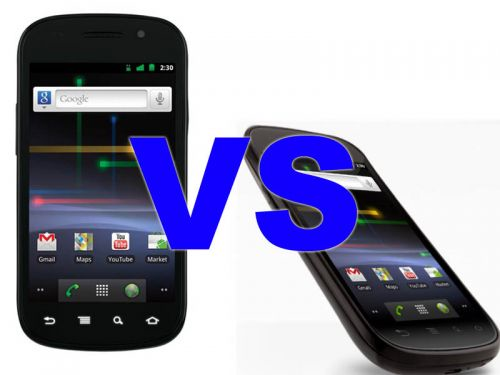 So we thought it apt to honour the genus with this week’s comparison, as we see whether the popular and powerful Nexus S can hold off a challenge from its brother, the Nexus Prime. Google’s Nexus S features a unique curved Super AMOLED screen that measures a fairly roomy 4-inches and operates at a resolution of 480×800. The Nexus Prime is rumoured to feature a huge 4.7-inch, 720P display though, which makes use of Samsung’s PenTile Matrix technology. Bigger isn’t always better but the quality being mooted for the Nexus Prime speaks volumes about both Google and Samsung’s intentions in the market and seems to generate a clear message: watch out, iPhone 5. As you’d expect from the next generation Google superphone the Nexus Prime features something special under the bonnet. Namely a dual-core 1.5GHz CPU, which will make mincemeat out of anything else around. Add to that 1GB RAM and a PowerVR SGX540 GPU and you’ve got yourself a pretty special device. The Nexus S, though very capable, pales in comparison with a 1GHz ARM Cortex-A8 CPU and 512MB RAM. GPU duties are ably handled by the same PowerVR SGX540 that is rumoured to feature in the Nexus Prime though, so it isn’t all bad. Both our contenders run, unsurprisingly, on Google’s Android platform. The Nexus S ships with the ever popular version 2.3.4 (also known as Gingerbread), while the Nexus Prime will reportedly launch version 4.0 (or 2.4) genially known as Ice Cream Sandwich or ICS. Ice Cream Sandwich is the next step in Android’s development and the platform takes all the best bits from iterations past and present to create a full mobile experience for both tablets and smartphones. The Nexus Prime may well be the first to offer the newest version of Android but it won’t be the only one, as Google plans to use Ice Cream Sandwich to unify the rapidly fragmenting Android ecosystem. As such all devices, old and new, can expect to see an update. Hurrah! The Google Nexus S features a nice 5-megapixel camera with LED flash, geo-tagging, touch-focus and autofocus which takes surprisingly good images even in low light. In addition to its primary camera the Nexus S also sports a front-facing VGA, to handle video calling. The WVGA video capture, while decent enough for most people who shoot the occasional clip, isn’t great though, but the next big software update for the device is rumoured to be bumping that up to 720p. Rumours regarding the Nexus Prime’s camera have been a little underwhelming to say the least. The device is rumoured to be shipping with the self-same 5-megapixel snapper that the Nexus S has! The only discernible improvement, if the rumour mill has it right, is that the Nexus Prime will offer a 2-megapixel front-facing camera, as opposed to the VGA on offer in the Nexus S.
Disappointing, if that’s the case! Early reports indicate the minimalist draftsmen have been hard at work on the Nexus Prime, giving it a bare, button free façade. We haven’t got any concrete measurements with which to truly compare the device to its predecessor, but with a 4.7-inch display it sure isn’t going to be a pocket friendly smartphone. The Nexus S, however, is a comfortable device to both hold and tote around in your jeans pocket. The device measures a fairly modest 123.9 x 63 x 10.9 mm and tips the scale at 129g, making it pretty average for a device in its class. The curved form factor (and screen) really add to the device’s comfort though, and we’ve seldom come across a more ergonomically pleasing device. If we were to drum up a complaint it would be that Samsung has used cheap materials to craft the device. A little metal would have been nice. So it’s a resounding victory for the unconfirmed Nexus Prime, but should we really be surprised? Comparing the Nexus Prime with the Nexus S is like comparing Homo sapiens with Neanderthal man, because for all its smarts and capability it’s nothing more than a primitive entity when held up against the next step of evolution. Put simply, if the leaked specifications surrounding the Nexus Prime are accurate, this October will see the release of the most powerful smartphone ever devised. And that’s very exciting. Previous articleExclusive: HTC Puccini in the wild, AT&T LTE support confirmed!